Hello, and welcome to JT Hughes Honda. 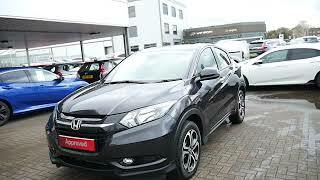 Today I'm going to show you around our new demonstrator of the Honda HRV. And this is the SE with the 1.6 diesel with the manual gearbox, finished off in the Rouge Black Metallic paint. Now, with the SE, you do get your rear integrated parking sensors. And as you'd expect from the crossover that the car is, is you get a large boot space. On the SE you do get your 16-inch alloy wheels, cloth interior, and, being the HRV, you do get the Magic Seats, as well with this one. The base lifts up, locks into place. Now, both sides do that, and they do also fold down completely flat, which more than doubles the available boot space, electric rear windows, and being one of our demonstrators, it will come with the five-year service plan included in the cost of the vehicle. Towards the front, it comes with front fog lights, LED daytime running lights, halogen headlights, front sensors, and it does come with Honda's sensing units in the centre of the windscreen. Now, that's there for your driving aids and your safety features on the vehicle. Moving on to the front, it comes with a multi-function steering wheel with cruise control, Bluetooth facilities, automatic wipers and auto headlights. Honda's 7-inch Connect touchscreen and the HRV does come with a built-in CD player, DAB digital radio. Just below that it is your climate control, 6-speed manual gearbox, electronic handbrake, a bit of storage space in the centre console. And just below all that, you have your modern-day connection points such as the USB, HDMI and this 12-volt power outlet. And there we have it. This one is now available for test drives. So if you'd like to book yourself in, or have any more questions, please give us a call here, and as always, we'll be happy to help.